Within Fontenelle Forest, the bur oak (Quercus macrocarpa) provides shelter and food to a multitude of native animals including deer, squirrels, mice, turkeys, blue jays, and red-headed woodpeckers. 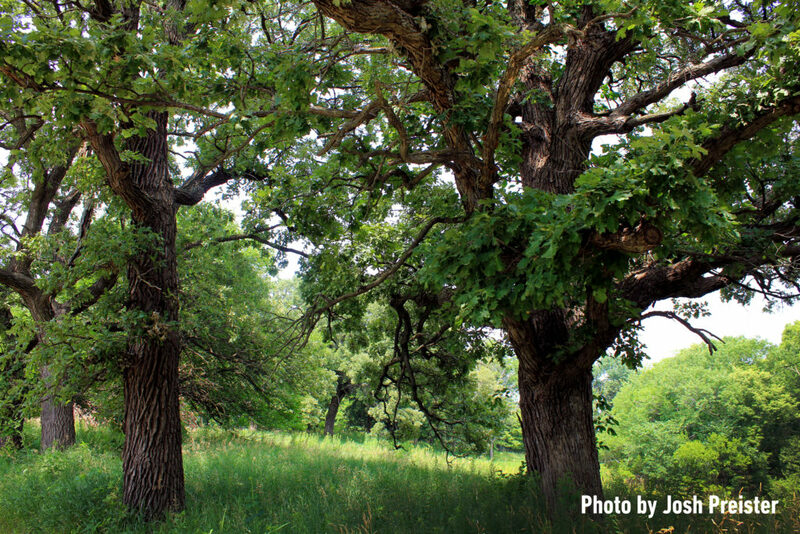 The bur oak—also known as blue oak, mossy-overcup oak and scrub oak—has the largest acorns of all native oaks and is very drought-resistant, growing slowly on dry uplands and sandy plains. These impressive trees are considered a keystone species within the forest due to the significant role they play within an ecosystem. Every few years, bur oak acorns gathered from the forest floor are grown into healthy young saplings. The acorns are shipped to Dr. Scott E. Schlarbaum (an Omaha native), Professor of Forest Genetics at the University of Tennessee. He works closely with the Flint River Nursery, a leading pioneer in the production of high quality oak seedlings. Through intense periodic applications of nitrogen and other fertilizers throughout the growing season, dramatic results are achieved without the need for genetic manipulation. In this controlled environment, saplings may reach the height of five feet within a single growing season, compared with three to six inches when growing in the wild. These saplings are then shipped to Fontenelle and planted in newly prepared savanna and woodland sites. To protect the trees, particularly from the white-tailed deer, the saplings are placed in cages until they are roughly one foot in diameter. To keep the openings from being invaded by the encroaching invasive plants, we apply prescribed fire as well as manually remove the undesirable plants. Our conservation staff and land steward volunteers hand-pull and cut down the plants and treat with herbicide when necessary. While it will take generations for the full effect of the restoration to be realized, we have already documented dramatic results. Native plants and grasses such as pale Indian plantain, hawthorn, feverwort, aster, big bluestem, sunflower and goldenrod are beginning to reemerge. These plants provide the habitat essential for many other living creatures. For example, the goldenrod species provides food and shelter for the monarch butterfly, the white-footed mouse, the northern cardinal and the downy woodpecker. Through the support of our members and donors, these little oaks will become the mighty giants of a mature oak savanna. GIS: By using GIS, it is easier to change a map and be more accurate about the portrayal of our trails on paper. Learn more here about how we use GIS information for conservation. Hack and squirt is a method of understory tree thinning and takes place in areas where over-abundant shade-tolerant trees (hackberry, elm, ironwood, and basswood) are too thick. Learn more about this tool in our conservation toolbox here. Plant and insect surveys are a part of our ecological monitoring. It’s important to track the changes in plant, animal, and insect life in the Forest to inform our Forest Management plan and help us understand how the Forest is changing. Learn more about our surveys here. Community Outreach: One of the objectives of our Oak Woodland Restoration grant from the Nebraska Environmental Trust is to inform and educate the public about our conservation efforts. There are targeted outreach audiences, as well. We attend conferences and meetings in the conservation community. We participate in forums, give presentations, and engage in conversations with other land management practitioners about best practices and new research as well as challenges and successes. Learn more about our community outreach efforts here. Daily life of a ranger, researcher, or land steward: Each morning, we get in our cars drive through the city, and see many individuals dragging along, drinking coffee and reluctantly heading to their place of employment. Our daily work operations, at Fontenelle Forest, whether it is winter, spring, summer, or fall is always different and monotony isn’t a word we use around these parts. Learn more about the daily life of a land steward here. Research: Student projects from the University of Nebraska at Lincoln tackled restoration issues at Fontenelle Forst from invasive species to urban fire and others. You can learn more about the projects here.